We are so not ready for this. When E! 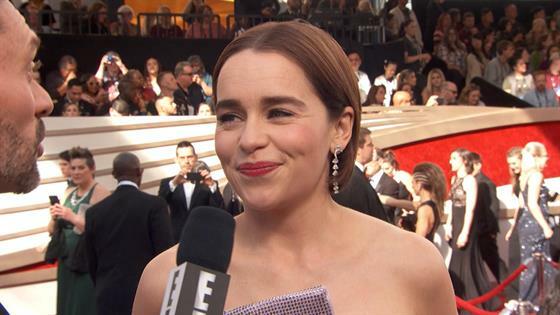 's Ryan Seacrest was joined by Emilia Clarke on the red carpet at the 2019 Oscars, he asked the Solo: A Star Wars Story star what she thought the reaction to the final Game of Thrones episode would be, and Clarke had just one word: "Shock." "Not enthusiastic, not pleased, but shocked?" Seacrest asked. "It's going to be huge, that much everyone needs to know," she said. "It took us a long time to film this one for a very good reason. But I think there's going to be some things...I know there's going to be some things in this last season that will shock people." Clarke then revealed she didn't take anything from the set after filming wrapped because she's "a goody two-shoes," and she was being watched "all the time." "I tried to throw some things under the wig, hide them in my bag, nothing," she said. "Apparently the throne itself you can't...I was there pushing it trying to get it in the car. It didn't fit, so what are you gonna do?" Solo is nominated for visual effects tonight, and Clarke explained that while many of the effects are added in later, there is something still very special about the way Star Wars movies are filmed. "On any other movie that is that huge, you've got lots of green [screen], and in ours, we didn't," she said. "We had lightspeed. When we were in the Falcon we had a huge surround screen and it felt like we were actually fully into lightspeed. It was insane." Game of Thrones returns Sunday, April 14 on HBO for its final season.